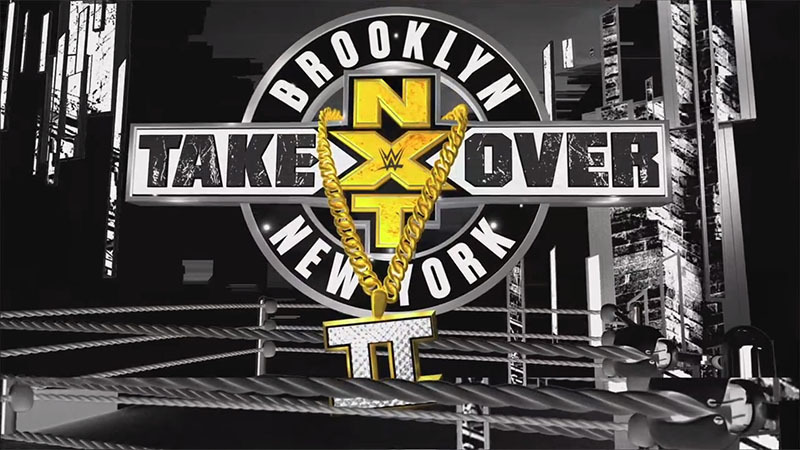 A year ago NXT took over Brooklyn, but this year’s roster has come a long way to reach where they are now. Good match and a very nice opener to the show. It seemed like this was going to be all Austin Aries at the start of the match, but Jose stuck around long enough to start getting some good offense of his own. This match (and this feud) has really helped Jose’s character by showing a serious, tough side of him. I wanted Aries to win, but I found myself pulling for Jose as well at times in the match. After the match, Austin puts Jose in the Last Chancery. Hideo Itami’s music starts to play, prompting Aries to release the hold. Itami heads to the ring, but Aries gets the jump on him. Itami counters with some strikes to Aries and hits the GTS. Ric Flair is in the front row of the crowd. Samoa Joe and Shinsuke Nakamura both get ready in the locker room area (Funaki and Kota Ibushi are hanging out with Nakamura). Pretty good match. Ember Moon had some very impressive moves, but the match did seem to bog down a little towards the middle. It just didn’t seem to go much of anywhere. When Billie Kay was in control, which she was for a good while, it seemed like we were just waiting for Ember Moon to do something. Still, it was enjoyable and showed the potential of both wrestlers. Earlier today, Bobby Roode told Andrea D’Marco that Brooklyn is an armpit. But Roode will make it, and NXT, glorious. Good match. Almas seemed to be the underdog in this one (since the crowd was firmly behind Roode), but he looked good in this. He had a lot of nice counters and ways to avoid Roode early on in the match, and he had some nice flying moves as the match went along. Roode also looked good, shutting down Almas when it mattered and wrestling a solid match. Earlier today, Triple H reveals the Cruiserweight Classic trophy (made by the guys from Orange County Choppers). Mauro Ranallo, Noam Dar, Brian Kendrick, Rich Swann, and Kota Ibushi are in the front row (along with the Orange County Chopper guys). Tommaso Ciampa gives Johnny Gargano a “DIY” t-shirt. The Revival are two time champs, but they haven’t beaten Gargano & Ciampa. A fantastic match! The Revival were at the top of their game, as were Gargano and Ciampa. It built to a great climax, and then it kept going. The Revival, as usual, did so many small things (and some big ones) to take an advantage in the match that it was almost difficult to keep track of them. Gargano and Ciampa matched The Revival in wrestling, plus they ramped up the excitement in just the right places. The finish was exciting and heartbreaking at the same time. This should probably be in contention for, at the very least, tag match of the year. Sasha Banks, Becky Lynch, and Charlotte are all in the front row. Bayley has worked to recover from her injury and finally get her rematch against Asuka. Great match. Asuka dominated most of the match, but Bayley showed her toughness be enduring a great number of strikes and holds. There were a few believable near falls, but the end to this match almost seemed inevitable. Samoa Joe doesn’t feel that Nakamura deserves a title shot, and Nakamura is getting under Joe’s skin. Mick Foley, Noelle Foley, and Finn Balor are in the front row. Really great match! They started by grappling, trying to find an advantage in a great sequence. After a while it started to look like Joe’s style of match as it became more methodical. Joe was relentless, hitting Nakamura with strikes and transitioning through holds. As the end drew closer, Nakamura would start to match Joe’s brutal strikes. Either man could have won this (and at times it seemed each would). This was another fantastic NXT Title match. I’m already looking forward to the inevitable rematch. This was a great show. The undercard was good, and the title matches all lived up to the hype. Once again, NXT is giving the main roster a run for its money during a big event weekend. I couldn’t decide. I think the main event had the bigger feel to it, but the tag match was super exciting. They’re both so different from each other that it’s almost not fair to choose one over the other, so I won’t. I think the women’s title match also deserves a mention for the real emotion that it captured.